More than 50 years ago, a small group of leaders from six Baptist state conventions here in the Upper Midwest gathered to discuss how they could help churches reach people with the gospel more effectively. They recognized that, even in that day, our Baptist faith and message were counter-cultural, not only to the spiritually lost, but also to those who had been exposed to the religious traditions that dominated the region. Being Southern Baptist in the north was and is not easy. The Midwest is a challenging mission field. Those leaders returned home, determined to work with local associations to invite 10 leaders per association to the first North Central States Rally. The objective was to encourage stronger evangelism and church planting, and to deliver highly relevant training along with the clear message that Midwest pastors and church leaders were not alone. I remember the first of these that I attended, back in January 2006. I was serving with the North American Mission Board, and was asked to come and lead a couple of conferences on the Acts 1:8 paradigm for missions strategy in the local church. Though I had been assured that it happened every three years, I have to admit that I did not expect to find many leaders gathered in snowy Indianapolis in late January. But I was wrong. Almost 900 pastors, church planters, associational leaders, and lay leaders from all over the Midwest came, and eagerly soaked in the training and inspiration provided by Midwest practitioners and state and national SBC leaders. In the hallways, in small group gatherings, and around the lunch and dinner tables, two central messages were clear. We are all here to advance the gospel in this region, and we are not alone. That 2006 Rally, and the 2009 and 2012 Rallies that followed it, were all hosted in Indianapolis, which is fairly central to the six state conventions whose leaders gather. But in January 2015, the gathering expanded to include 10 state conventions. It took on a new name, The Midwest Leadership Summit. It attracted more than 1,000 leaders, the largest ever. And we were blessed to host it right here in Springfield, Illinois. An all too common mindset these days seems to be that it’s too difficult to attract people to meetings. It’s not just that people are busy and travel is expensive. There seems to be a spirit of independence, sometimes even isolationism that can easily creep in to churches and their leaders. It’s easy to convince ourselves that things will be easier, simpler, cheaper, if we just stay home and focus on our own church. But it is autonomy pulled together into cooperation, not independence pulled apart into isolation, that has produced missions advance by churches over the years. Sure it’s challenging and costly to get together, especially for busy leaders. But when committed, missions-minded leaders gather and ask how they can work together to more effectively advance the gospel, good things are bound to happen. In the days ahead, we at IBSA will be working more intentionally with associational and church leaders to facilitate key leadership gatherings that are focused on evangelistic, gospel advance. You will see some of those plans elsewhere in this issue. Some will be fairly local, in the form of leadership cohorts. Some will be “virtual,” facilitated by webinars or other online tools. And yes, some will continue to be statewide, even though that can involve costly time and travel. We believe the gathering of leaders is worth it. It’s when leaders gather that we can remind one another that the mission of reaching people with the gospel is urgently important, and bigger than any of our individual lives, or churches. 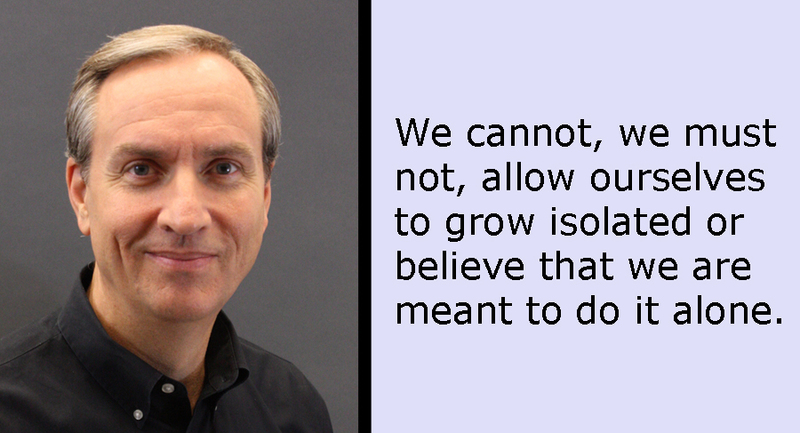 We cannot, we must not, allow ourselves to grow isolated or believe that we are meant to do it alone.